LEXINGTON, Ky. (Sept. 22, 2017) — The Hon. 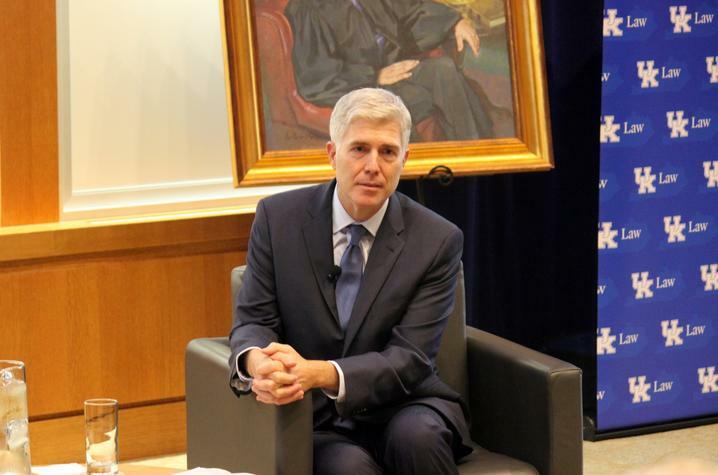 Neil M. Gorsuch, Associate Justice of the Supreme Court of the United States, spent Thursday evening on the University of Kentucky campus. He spoke to University of Kentucky College of Law students as well as judges, lawyers and clerks from across Kentucky. During his talk, he offered a few pointers to UK Law students in the crowd. "Give back a little bit. If you’ve made it to an institution like this, you’ve been blessed and have a lot to offer your fellow citizens," he said. Justice Gorsuch was here as part of the John G. Heyburn II Initiative for Excellence in the Federal Judiciary. 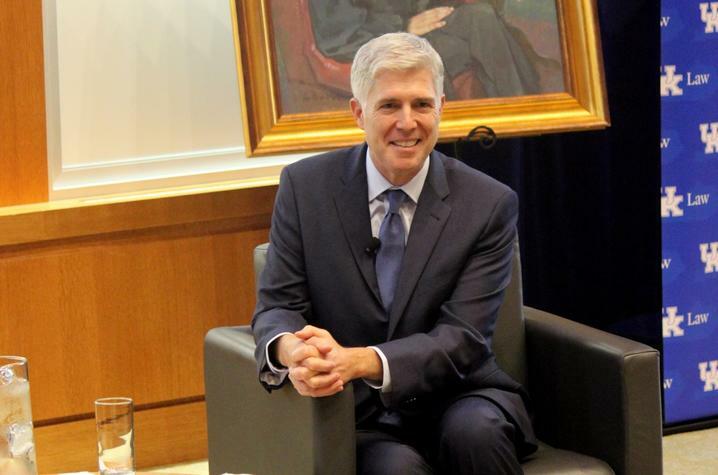 After being introduced by U.S. Senate Majority Leader Mitch McConnell, the justice spoke to a packed crowd in the Gatton College of Business and Economics' Kincaid Auditorium. UK Law Professor Paul Salamanca served as moderator and posed several questions to the justice on different topics, including his relationships with other justices and advice for law students. "Practice law so that you can look back after a 30-year career and be proud,” he told UK Law students and practitioners in the audience. Justice Gorsuch was born in Denver, Colorado, Aug. 29, 1967. He and his wife Louise have two daughters. He received a B.A. from Columbia University, a J.D. from Harvard Law School, and a D.Phil. from Oxford University. He served as a law clerk to Judge David B. Sentelle of the United States Court of Appeals for the District of Columbia Circuit, and as a law clerk to Justice Byron White and Justice Anthony M. Kennedy of the Supreme Court of the United States. From 1995-2005, he was in private practice, and from 2005-2006 he was Principal Deputy Associate Attorney General at the U.S. Department of Justice. He was appointed to the United States Court of Appeals for the Tenth Circuit in 2006. He served on the Standing Committee on Rules for Practice and Procedure of the U.S. Judicial Conference, and as chairman of the Advisory Committee on Rules of Appellate Procedure. He taught at the University of Colorado Law School. President Donald J. Trump nominated him as an Associate Justice of the Supreme Court, and he took his seat on April 10, 2017. In addition to his talk Thursday evening, the justice also participated in a forum Friday morning with approximately 130 law students, moderated by James C. Duff, director of the Administrative Office of the U.S. Courts and former UK basketball player. The Heyburn Initiative, a national, nonpartisan federal judicial initiative, was announced in 2016 by President Eli Capilouto, U.S. Senate Majority Leader Mitch McConnell and Dr. Martha K. Heyburn, in honor of the trailblazing U.S. Senior District Judge John G. Heyburn II. In partnership with the UK College of Law and UK Libraries, the initiative established a national lecture series on relevant judicial topics and is launching an archives and oral history program for Kentucky’s federal judges. For more information about the John G. Heyburn II Initiative for Excellence in the Federal Judiciary, visit www.heyburninitiative.org.